Description: This is a 8-piece Pick-Up & Peek Puzzle. The 8 hardwood pieces fit into a hardwood tray. All of the pieces have a small yellow plastic knob on them that allows child to lift the piece from it's place on the tray. Another picture is hidden under the puzzle piece, and is revealed when child picks the piece up. The puzzle piece are specially cut to double as play figures for children. This puzzle is very rare. FPT2279 - Rectangular pressed wood puzzle board with recessed areas to place 8 puzzle pieces. 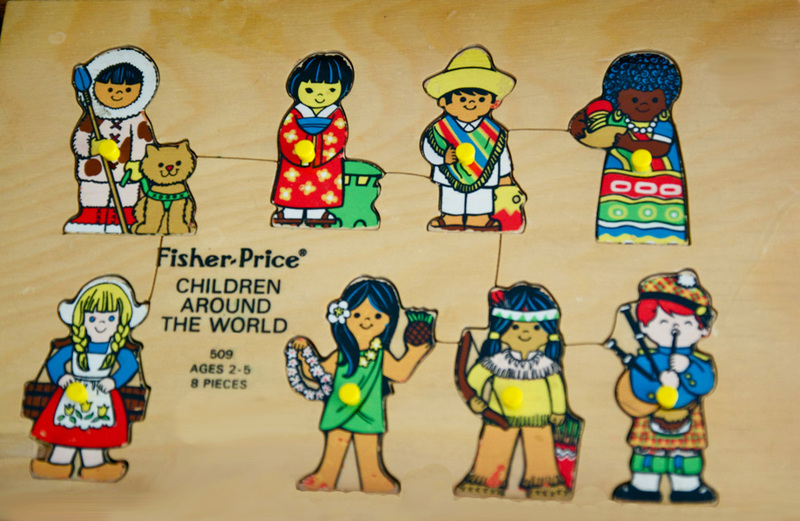 The puzzle board is marked "Fisher-Price®, CHILDREN AROUND THE WORLD, 509, AGES 2-5, 8 PIECES" in the center. FPT2280 - Eskimo boy with a dog beside him. Has a small round yellow plastic upright peg in the center of the puzzle piece. FPT2281 - Chinese girl wearing a red dress with white designs. Has a small round yellow plastic upright peg in the center of the puzzle piece. FPT2282 - Mexican boy wearing a yellow sombreo and a multi-colored poncho. Has a small round yellow plastic upright peg in the center of the puzzle piece. FPT2283 - African girl wearing a red, green, and yellow African design dress. Has a small round yellow plastic upright peg in the center of the puzzle piece. FPT2284 - Dutch girl wearing a red dress with a white bonice over it, and a white dutch hat. Has a small round yellow plastic upright peg in the center of the puzzle piece. FPT2285 - Hawiian girl wearing a green dress and a pink flower in her hair. Has a small round yellow plastic upright peg in the center of the puzzle piece. FPT2286 - American Indian girl wearing a feather in her hair and carrying a bow and arrows. Has a small round yellow plastic upright peg in the center of the puzzle piece. FPT2287 - Scottish boy blowing his bag-pipes. Has a small round yellow plastic upright peg in the center of the puzzle piece. FP509BOX1972 (Box ONLY) Sold in display box that measures 13-1/2" wide, 11-1/3" high and 7/8" thick. FP509SET1972 - (Complete Set) Complete puzzle set. This puzzle was sold in #550 Pick-Up & Peek Puzzle Assortment.